I visited Castlemartin this weekend, an area of coastline used as a firing range by the MOD and closed to the public except on odd occasions. 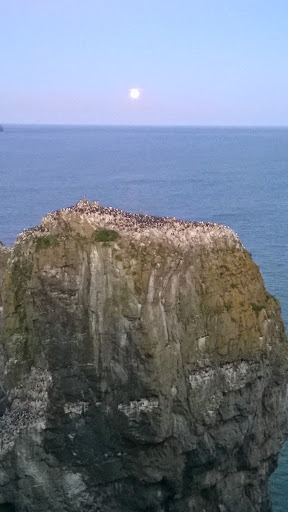 It is the site of some spectacular loomeries, mainly on flat topped sea stacks close to the cliff ledge, most notably Craig Elegug (guillemot rock) which allows close eyelevel views of the birds. I wanted to focus on these really dense groups, as a type I had not yet explored in the loomoery scroll drawings. This density resulted in some pretty intense and laborious drawing, working in detail over the whole weekend to produce a drawing of a long vertical ledge cascading down the left side of Elegug. Last night there was no night firing so I had a chance to visit Castlemartin from five until dark. 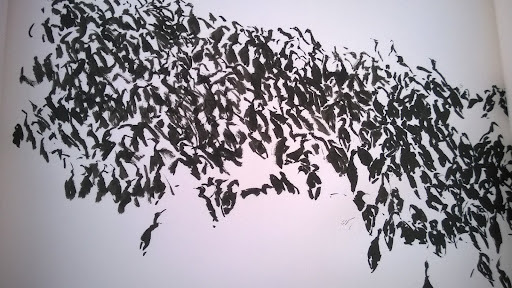 As a remedy to the detailed drawing of the weekend I wanted to cut loose and did this by working in ink and brush, using minimal brush strokes to describe each bird. I was able to cover a lot of ground quickly this way and see the colony as a complete entity. 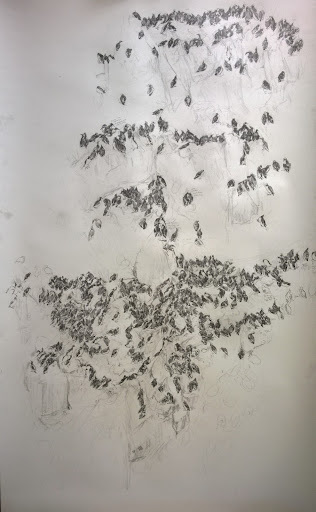 As the drawing progressed from left to right as I always work on a scroll, the colony became denser and I soon lost individuals in the mass of movement. 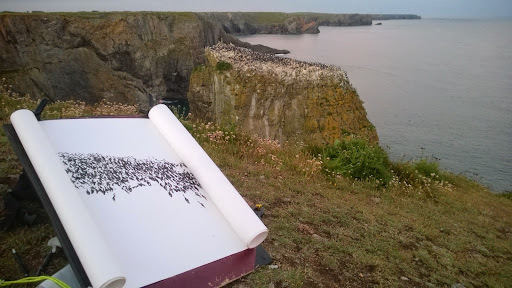 In response my mark making had to grow faster to cope with the constant movement and I soon found a new rhythm of working to describe whole formations of birds rather than individuals. I felt my drawing became more energetic the more intense the energy of the colony became deep in the densest sections. In this respect, despite losing my more illustrative approach I feel this drawing approach responds to and therefore documents the energy and cohesion of a loomery even if it is visually a more abstract expression. 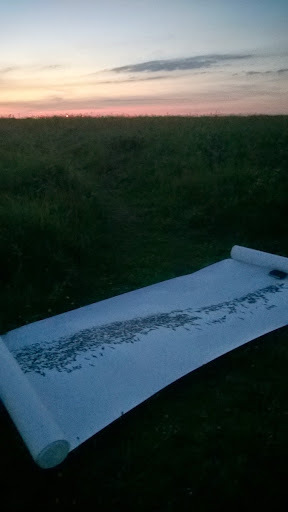 I finished the drawing at 22.47 in total darkness which may of helped the drawing progress as well. This may be the last of these drawings I make form observation this season, unless I can return in time for fledging. It seems appropriate to end with a night drawing, on a still night and a near full moon rising but also with new ideas to give the project momentum.